When you read about Dave Ramsey’s baby steps, the one thing you won’t often read is that Dave encourages people to give while they pay off debt. This can contradict every single thought that our brains tell us is rational. I get it. If you want to get out of debt and have more money, why would you give some away? There are a thousand different debatable reasons as to why someone might do this. Our reasoning is probably different than you think. It had less to do with the church and more to do with what we needed. 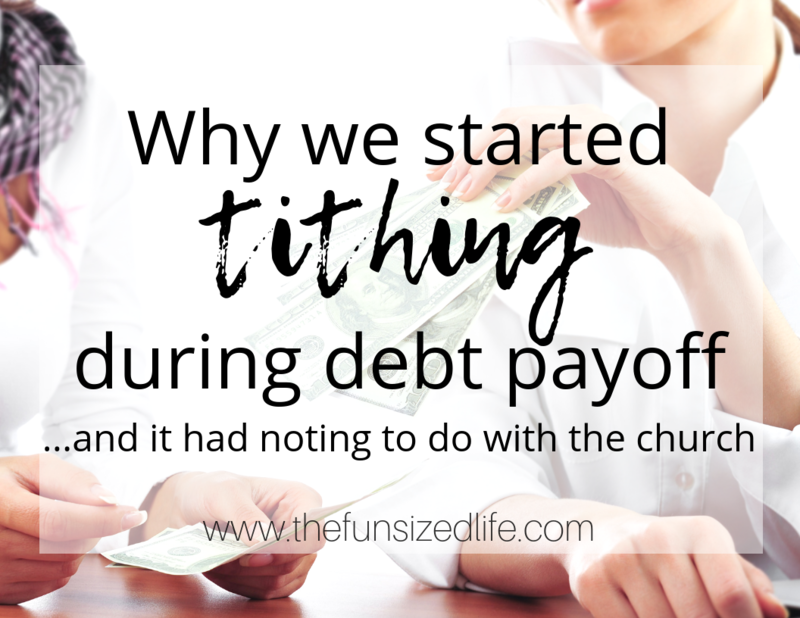 So, if you are in full-on debt payoff mode, read on to see why we started tithing during debt payoff and what happened when we did. We started getting intentional about paying off our debt as soon as we downsized our house. In just under 3 years we have been able to completely pay off our debt and start building wealth. Using the debt snowball, we were able to pay off $6,000 of debt in just 6 months and it hasn’t stopped yet. See how we did it and get the free printout so you can too! Find an extra $200 in your budget. Apply this $200 to your smallest debt on top of your minimum payment. Continue making minimum payments on all other debts. Once your smallest debt is paid off, apply the $200 plus previous minimum payment to next smallest debt. This was the debt payoff method we stuck to except we always paid more than $200. We have found ways to earn extra cash and rework our budget so we could put as much money possible toward our debt payoff. Can I Afford to Get Out of Debt? How to Find That Extra Money to Get You Started. Tithing is often something discussed in the Bible which tends to turn a lot of people off instantly. What tithing means is, “tenth.” Giving a tenth of your earnings away. For example, if you make $3,000 per month, a tenth would be $300. Although 10% doesn’t sound like a lot, looking at it in real numbers can be very overwhelming. It’s easy to see why many people would choose to avoid partaking in tithing. For the sake of diversity, I won’t dive in deeper as to the specific Biblical reasons behind it. Instead, I want to tell our story about why we started tithing even during debt payoff. I won’t lie, we are big churchgoers. We have found a church that fits our family’s needs and that truly speaks to our hearts. They also have the option to watch online live or anytime! We have attended churches before that speak very heavily on tithing. So much so that it began to feel like a guilt trip. Our new church has never made us feel this way about tithing. Instead, they have expanded our minds and encouraged us to practice tithing for ourselves rather than for our church’s benefit. In fact, each year they hold a tithing challenge and encourage you to give to other churches if you’d like. They believe in its benefits that much. So what are the tithing benefits outside the church? For us personally, we had let money control our lives for far too long. When I met Tom he was bankrupt and foreclosing on his house. The next 7 years we spent digging ourselves into deeper debt. We bought whatever we wanted. Went out whenever we wanted and then complained that we didn’t have any money. So what if tithing helped take away that false power that money had over us? Wouldn’t it be the same thing as someone trying to lose weight turning down a piece of chocolate cake? Instead of clinging to food (which is the problem to begin with) the smarter practice is to work on letting go of the control food has on you. When it came to our finances, rather than a scarcity mindset, we decided to change our thoughts to an abundant mindset. We began tithing to help us slowly loosen the grip that money had on us. We started tithing during our final year of debt payoff. It had been something we had tried before and failed at. I believe it failed for us before because we tithed more out of fear or obligation. We felt like we had to. It made us nervous. This time, it felt good. We felt prepared. Instead of seeing lack, we began to pay attention to the amazing amounts of abundance we have in our lives. There are so many things to be thankful for in our lives…why not give some of that greatness away? The last thing I want to be is greedy. I never want to be the kind of person that clings to money. At least never again. In fact, one of my main reasons for getting out of debt in the first place was because I wanted to be able to give freely to others. That was a main goal of mine. Personally, I didn’t want to wait to be totally out of debt before I got to do this. Stressed less – There is an amazing weight lifted off your shoulders when you let go of something that had previously kept you down. Making money became easier – It might sound totally crazy, but almost as soon as we started giving, more money started coming in. I started selling things online (perhaps because I was able to see more things I had been needlessly clinging to.) Everything sold in an instant. I found more ways to make money. We were in a money making groove and it was amazing. Our groceries lasted longer – I can’t even explain this one. It seems crazy. Before I always seemed to have to go to the store every week. All of a sudden, it was like our food never ran out. We taught our children generosity – Because when we gave, we gave with cash our children were able to visually see us giving each month. We have always had a few charities that are automatically taken from our bank each month but that wasn’t teaching our kids anything. Not only do we want them to make better money choices than we did, we also want them to learn generosity and giving. Our debt payoff stayed on track – I say it stayed on track, but really, it improved. We went from putting around $800 per month toward debt to putting almost $2,000 toward debt each month. Money lost its grip – More and more money stopped being a main concern. We had previously focused on budgeting and worried about numbers all day long. Checking our bank account was a daily habit. It seemed that all of these worries were no longer present. Because we learned to let go. Not everyone is a churchgoer or has faith. I understand that. Even if you are not a churchgoer, you might consider giving to a local church whose mission you support. If they are working to help clean up your neighborhoods or are taking in the homeless, they could probably use your financial support. Is there a local charity or cause that you would love to support? Now is the time to start giving. The one thing with this that I recommend is rather than setting up automatic payments, try writing a check each month. Hands-on giving just seems to have a far greater impact. I think this may be our next step in our giving mission. Opening a giving checking account. Putting our money each month into one designated account and then if and when we are presented with a person or opportunity to give, we can give with our whole heart. This is a great POV. I’ve also seen how tithing actually relieves stress. It’s amazing how much the money can stretch through the month when we’re open to taking care of the needs of others. Tithing should definitely be part of the monthly budget plan. Thanks for sharing your experience. So glad you can relate! It’s a strange thing that seemingly can’t be explained. It just works!